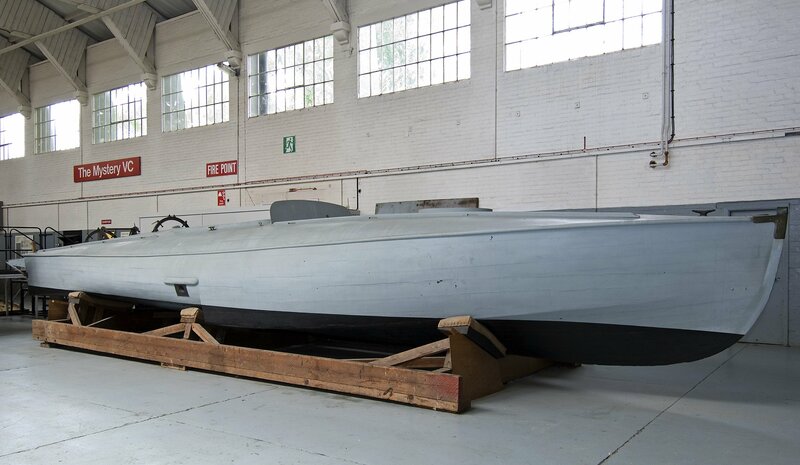 CMB 4 (Coastal Motor Boat 4) was designed as a torpedo boat that could manoeuvre at high speeds in shallow waters. She was powered by a single Green V/12 cylinder petrol engine of 250bhp, capable of reaching the top speed of 35 knots. She carried a Lewis machine gun and a single 18inch torpedo in a trough aft of the cockpit ready to be launched tail first over the stern. Her unique design allowed the vessel to steer clear of the torpedo’s tracks if both the boat and vessel were travelling at the same speed. Her wooden hull, which is 8.5ft wide and 40ft in length (44ft including torpedo rails), is original and of sound condition. However, most of her internal fittings are believed to have been lost. 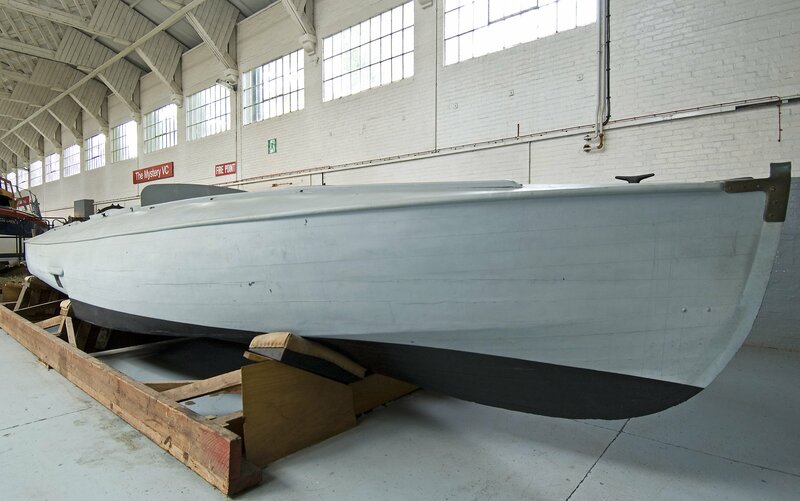 She underwent conservation work at the International Boatbuilding Training College (IBTC) at Lowestoft in 1983, but some further maintenance still needs to be carried out. CMB 4 was the successor to earlier steam torpedo boats of the late 1870s and early 1880s, following on from initial experiments by J.I. Thornycroft Ltd in the early 1900s. She is significant being one of the twelve first CMBs, which were ordered in January 1916 under great secrecy. Because of the risk of the enemy finding out about their existence and jeopardising future operations, trials were carried out at night. Due to their specialist nature crews had to be trained from scratch; they earned the name the ‘suicide’ club reflecting the perilous nature of their work. CMB 4 is associated with a number of important actions during the First World War. She was despatched to Dunkirk as part of the Dover Patrol under the command of W.N.T Beckett, and took part in torpedoing a German torpedo boat destroyer on 7 April 1917. She also assisted in the Ostend raid of 23 April 1918. CMB 4 was sent to Russia in 1919 to assist the Czarist ‘White’ Russian cause, running couriers in and out of Petrograd by sea and was decorated appropriately, with her commander Lt Augustus Agar being awarded the VC, S/Lt Hampsheir receiving the DSC, and Chief Motor Mechanic Beeley being given the CGM. After the First World War, CMB 4 was exhibited at the Motor Boat Exhibition at Olympia and subsequently at the Crystal Palace. She has been recorded on the National Register of Historic Vessels since 1996 and is a member of the National Historic Fleet. CMB 4 is of national significance as a rare survivor of an important wartime innovation. Her hydroplane design with its skimming dish hull and sleek lines was intended to pass across the surface of the water at high speeds, whilst still having good sea-going qualities. This enabled her to be used as an attack vessel capable of making a fast get away. CMB 4 is no longer operational and has been preserved as a static exhibit at the Imperial War Museum at Duxford. Source: NHS-UK team, 10 November 2015. In the summer of 1915, three serving Lieutenants - Hampden, Anson and Bremner - put up the idea for a fast, hit and run torpedo carrier capable of skimming over minefields and attacking German surface shipping in the Heligoland Bight. Light cruisers would carry them to within 60 miles of a target. They needed to be capable of 30 knots and to displace no more than 4.5 tons. Thornycroft had been toying with the idea of skimming hulls, notably a series of hydroplanes all called MIRANDA. One built in 1910, reached 35 knots. The MIRANDAs were probably the world's first planing craft. They were also the first prototype CMBs. Altogether 117 were built: 39 of the 40ft class, 73 of the 55ft class and 5 of the 70ft minelaying type. Their two bases were Osea Island on the Blackwater in Essex and Dunkirk. The Dunkirk boats claimed 4 sinkings. 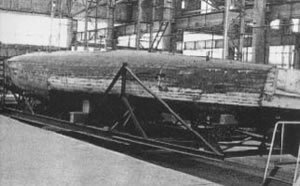 The smaller class carried one torpedo; the 55ft class, two. They were carried pointing forward in a trough on the stern and were launched by being pushed along rails and over the transom by a bell-mouthed steel ram worked by expanding cordite gases. As the torpedo was faster than the parent craft, the CMB had to swerve out of danger. CMB 4 was a 40 ft boat in which Lt. Augustus Agar won the VC when he sank a Russian carrier at Kronstadt in 1919.